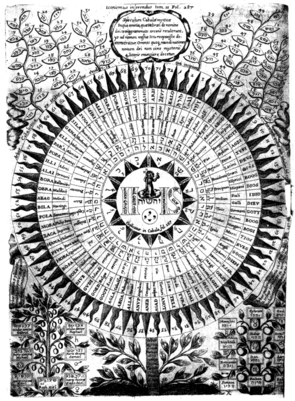 A "diagram" of the names of God in Athanasius Kircher's Oedipus Aegyptiacus (1652–54). The style and form are typical of the mystical tradition, as early theologians began to fuse emerging pre-Enlightenment concepts of classification and organization with religion and alchemy, to shape an artful and perhaps more conceptual view of God. The Name of God, or Holy Name is the name in monotheistic traditions or religions that is used in liturgy or prayer. Conceptions of God can vary widely, but the word God in English, and its counterparts in other languages, are used irrespective of theological particulars. Shangdi 上帝 (Hanyu Pinyin: shàng dì) (literally King Above) was a supreme deity worshipped in ancient China. It is also used to refer to the Christian god in the Standard Mandarin Union Version of the Bible. Likewise, Korean Christians and Vietnamese Christians also use cognates of this name, to refer to the Biblical god. Zhu, Tian Zhu 主,天主 (lit. Lord or Lord in Heaven) is translated from the English word, "Lord", which is a formal title of the Christian god in Mainland China's Christian churches. Tian 天 (lit. sky or heaven) is used to refer to the sky, but is not a personification of the sky. Whether it possesses sentience in the embodiment of an omnipotent, omniscient being is a difficult question for linguists and philosophers. Tengri, also used to refer to the sky, is the one God of many ethnic groups in China, Mongolia, and the Near East, a practice now called Tengriism. Radha and Krishna Venerated within several traditions of Hinduism as the Supreme God, svayam bhagavan and his shakti, or as manifestations thereof. Refereed to by the popular recitation of the holy names. Within Hinduism, there are a number of names of God which are generally in Sanskrit, each supported by different traditions within the religion. Brahman, Bhagavan, Ishvara, and Paramatma are among the most commonly used terms for God in the scriptures of Hinduism. Ishvara (īśvara) means "Cosmic Controller" or "Lord". Maheshvara (mahā-īśvara) means "Great Lord", used as an attribute of god Shiva. Parameshvara (parama-īśvara) means "Supreme Lord". Paramatman (parama-ātman) means "Super Soul". Brahman (brahman) means "The Ultimate Reality". Saguna Brahman refers to the personal Brahman with infinite qualities, whereas Nirguna Brahman refers to the impersonal Brahman without any attributes. Para Brahman (para-brahma), an ineffable entity, best translated as "The Absoute Truth", Supreme Brahman, or Supreme Cosmic Spirit. Adi Purusha (ādi-puruṣa) means "Timeless Being", "Primordial Lord", "First Person". Vishnu is seen as Para Brahman within Vaishnava traditions, and the Vishnu Sahasranama enumerates 1000 names of Vishnu, each name eulogizing one of His countless great attributes. The names of Vishnu's Dasavatara in particular are considered divine names. Krishna (Kṛṣṇa) is associated with Vishnu and certain Vaishnava traditions also regard Him as Para Brahman and Svayam Bhagavan (svayambhagavān) or the Lord Himself. In Krishna-centered schools of Vaishnavism, which includes the Nimbarka, Vallabha and Caitanya schools Krishna is held as the Supreme Personality of Godhead based on the descriptions of Him within the Bhagavata Purana and Mahabharata, with particular reference to the Bhagavad-Gita. Rama (Rāma) is associated with Vishnu and is especially venerated in bhakti literature, such as that of Kabir and Ravidas, and more recently in the writings of Mohandas Gandhi. Shiva is regarded as Saguna Brahman in Shaivism. The Shiva Sahasranama enumerates 1000 names of Shiva as Ishvara. Ganapatyas focus on worship of Ganesha (also called ganapati), and Shaktas worship Shakti as the Supreme. Smartha sect considers Vishnu, Shiva, Devi, Ganesha, and Surya as equal reflections of Nirguna Brahman as Saguna Brahman. Waheguru, meaning Wonderful Teacher bringing light to remove darkness, this name is considered the greatest among Sikhs, and it is known as 'Gurmantar', the Guru's Word. Ek Onkar, ek meaning "one", emphasizes the singularity of God. It is the beginning of the Sikh Mool Mantra. God according to Guru Nanak is beyond full comprehension by humans; has endless number of virtues; takes on innumerable forms; and can be called by an infinite number of names thus "Your Names are so many, and Your Forms are endless. No one can tell how many Glorious Virtues You have." There are no direct names of God in Jainism, as this religion is nontheistic. Gods do not figure into its philosophy. However, Mahavir and other 'prophets' or 'perfected beings' are known as Tirthankar (literally 'Fordmaker', meaning one who becomes enlightened) or Jina. Theravada Buddhism is nontheistic. Gods do not figure into its philosophy. In Tibetan Buddhism, the Adi-Buddha is conceived of as the eternal aspects of Buddha-nature, such as wisdom and compassion. In Chinese Mahayana Buddhism, Vairocana (Chinese: Dàrì Rúlái) is the embodiment of dharmakaya, the omnipresent and cosmic Buddha-nature. Although Vairocana is anthropomorphized in sculpture, dharmakaya is not considered an anthropomorphic force. In Shingon Buddhism, Vairocana is called Dainichi Nyorai. In Jodo Shinshu, the largest sect of Buddhism in Japan, calling upon the name of Amida Buddha is considered to open the believer to the infinite, but this name is not anthropomorphized. Aten is the earliest name of a supreme being associated with monotheistic thought, being the solar divinity which Akhenaten had declared the only god of the state cult, as part of his wholesale absolutist reforms, thereby threatening the position of the various temple priesthoods, which had the old polytheism restored immediately after his death. See also the Great Hymn to the Aten. Ra is the Egyptian Sun God in Polytheistic Egypt, any time outside of the Reign of Akhenaten. Before 1353 BC and after 1336 BC, OR before 1351 BC and after 1334 BC, whenever Akhenaten was pharaoh. While some of the older deities have names long pre-dating the Latin people the Romans belong to, and even more were adopted with their autochthonous names (or Latinized in a recognizable way), many minor divinities were named simply as personifications of various minor aspects of daily life. Latin also prominently used an abstract word for god, deus (hence deity and, from its adjective divinus, divinity), from Proto-Indo-European root deiwos, also the root of words for "sky" and "day" – the god-sense is originally "shining," but "whether as originally sun-god or as lightener" is not now clear; the epithet Deus Optimus Maximus, DOM "Best and Greatest God", coined for Jupiter, the pater familias of the Roman pantheon, was later adopted in Christianity, as well as Deus. The name of this Persian god of light, one of the earliest Indic words we possess, being found in clay tablets from Anatolia dating to about 1500 B.C, reported in English only since 1551, is from Latin, derived from the Greek Mithras. This was in turn derived from Avestan Mithra-, possibly from an Indo-Iranian root mitram "contract," whence mitras "contractual partner, friend," conceptualized as a god, or, according to Kent, first the epithet of a divinity and eventually his name; from proto-Indo-European root base mei- "to bind"; related to Sanskrit Mitra, a Vedic deity associated with Varuna. In the Hebrew scriptures (i.e. the Law Torah, plus the Prophets [Nevi-im] and the Holy Writings /Hagiographa [ Kethuvim] the Jewish name of God is considered sacred and, out of deep respect for the name, Jews do not say it. (See Exodus 20:7) The tetragrammaton (Hebrew: יהוה, English: YHVH or YHWH, these Hebrew consonants named, reading right to left: "yod...heh...vahv...heh.") is the name for the group of four Hebrew symbols which represent the name of God. The Tetragrammaton occurs 6,828 times in the Hebrew text printed in Biblia Hebraica and Biblia Hebraica Stuttgartensia. Neither vowels nor vowel points were used in ancient Hebrew writings, but are usually taken to be "a", "e", "i", "o" or "u." From the Hebrew tetragrammaton modern Christians have adopted pronunciations such as "Yahweh", "Yahveh" and "Jehovah". Clement of Alexandria transliterated the tetragrammaton as Ιαου. The above claims were founded upon the understanding that Clement of Alexandria had transliterated YHWH as Ιαουε in Greek, which is pronounced "Yahweh" in English. However, the final -e in the latter form has been shown as having been a later addition. For a more in-depth discussion of this, see the article Yahweh. Some claim that the form Yahweh is an uncertain pronunciation, (in ancient Hebrew, the earliest forms of the tetragrammaton were written without vowels), but the article on Yahweh details why the traditionally used English word Jehovah also cannot be 'correct'. Some avoid using either Yahweh or Jehovah altogether on the basis that the actual pronunciation of the tetragrammaton has been lost in antiquity. Instead they refer to him simply as God, or The Lord. Jesus (Iesus, Yeshua, Joshua, or Yehoshûa) is a Hebraic personal name meaning "Yahweh saves/helps/is salvation",. Christ means "the anointed" in Greek. Khristos is the Greek equivalent of the Hebrew word Messiah; while in English the old Anglo-Saxon Messiah-rendering hæland 'healer' was practically annihilated by the Latin Christ, some cognates such as heiland in Dutch survive. The less evangelical branch of the Quakers often refers to God as The Light. Another term used is 'King of Kings' or 'Lord of Lords' and Lord of the Hosts. Other names used by Christians include Ancient of Days, Father/Abba, 'Most High' and the Hebrew names Elohim, El-Shaddai, and Adonai. Principle, Mind, Soul, Life, Truth, Love, and Spirit are names for God in Christian Science. These names are considered synonymous and indicative of God's wholeness. The name, "Abba/Father" is the most common term used for the creator within Christianity, because it was the name Jesus Christ (Yeshua Messiah) himself used to refer to God. In the movement Imiaslavie ("Name glorification") opposed by the Russian Orthodox Church, the name of God is God Himself and can be used to evoke miracles. The Assemblies of Yahweh is currently the only Christian group to use the name Yahweh exclusively and consistently. See also: Names and titles of Jesus in the New Testament. Allah is the most frequently used name of God in Islam. It is an Arabic word meaning "the god", and was used in polytheistic pre-Islamic Arabia to refer to the supreme God above all of the "other gods" and idols; a concept similar to that found in many polytheistic societies. The word Allah is a linguistic cognate of the Hebrew word Eloah and a translation of the English word "God". When speaking of God, Arab Jews, Druze and Arab Christians also generally use the word Allah. A well established Islamic tradition enumerates 99 names of God, each representing certain attributes or descriptions of God; in which God is seen as being the source and maximum extent of each name's meaning. The names Ar-Rahman and Ar-Raheem are the most frequently mentioned in the Qur'an, both meaning the "Most Merciful", but with different emphasis' of meaning, either of which are also often translated as the "Most Compassionate" or the "Most Beneficent". Besides these Arabic names, Muslims of non-Arab origins may also sometimes use other names of their own languages which refer to God, such as the Ottoman anachronism Tanrı (originally the pagan Turks' celestial chief god, corresponding to the Ancient Turkish Tengri), or Khoda in Persian language which has the same Indo-European root as god. The use of the word "God" in English is also seen as acceptable to most Muslims. Bahá'ís refer to God using the local word for God in whatever language is being spoken. Bahá'ís often, in prayers, refer to God by titles and attributes, such as the Mighty, the All-Powerful, the Merciful, the Ever-Forgiving, the Most Generous, the All-Wise, the Incomparable, the Gracious, the Helper, the All-Glorious, the Omniscient. Since the languages in which the Bahá'í Faith was first authored were Arabic and Persian, the term Allah and other "names" are used in some specific contexts, even by non-Arabic speakers. The above-mentioned attributes are sometimes referred to in their Arabic form - for instance Bahá'ís refer to "Bahá" (meaning Glory or Splendour) or any derivation thereof (ex. Al-Abhá, or The Most Glorious) as the Greatest Name of God. Haile Selassie, refers to "Power of the Trinity". "His Imperial Majesty Haile Selassie I, Conquering Lion of the Tribe of Judah, King of Kings of Ethiopia and Elect of God" (Ge'ez ግርማዊ፡ ቀዳማዊ፡ አፄ፡ ኃይለ፡ ሥላሴ፡ ሞዓ፡ አንበሳ፡ ዘእምነገደ፡ ይሁዳ፡ ንጉሠ፡ ነገሥት፡ ዘኢትዮጵያ፡ ሰዩመ፡ እግዚአብሔር; girmāwī ḳadāmāwī 'aṣē ḫāylē śillāsē, mō'ā 'anbassā za'imnaggada yīhūda nigūsa nagast za'ītyōṗṗyā, siyūma 'igzī'a'bihēr). King of Kings (nəgusä nägäst) is the name of God incarnate in the Rastafari movement. God is called Jah and Haile Selassie is called Jah Rastafari, from his precoronation name Ras Tafari Makonnen. Xwidê/Xwida/Xuda and Yezdan are the terms used for God in Kurdish. Abraxas is a god uniting the dualistic concepts in Gnosticism. See also Monad (Gnosticism). Cao Đài is the name of God in Caodaism. Tenri-Ō-no-Mikoto is the principal name of God in Tenrikyo. Tenri-Ō-no-Mikoto is also called Tsukihi, Oyagami, and Kami. Tenchi-Kane-no-Kami is the name of God in Konkokyo. Mioya-Ookami is the name of God in the PL Kyodan. In some older shinshūkyō as Kurozumikyō, the Shinto deity Amaterasu is worshipped as the universal God and creator of all things. Shinto itself does not have any principal deity. Seicho no Ie, God Light Association, and some other 20th century shinshinshūkyō do not have any particular word for God but use the most common word in the language being spoken. El Cantare is the name of God in Happy Science. Ahura Mazda "Lord of Light" or "Lord Wisdom" (wisdom and light being synonymous in either case) is the name of the supreme benevolent god in Zoroastrianism. Zoroastrians today may refer to Ahura-Mazda as 'Ormazd,' simply being a contraction of the original term. In Deism and Pantheism, and in variations of these like Pandeism and Panentheism, God is sometimes referred to as Deus (pronounced Day-us), the Latin word for god, which gave rise to the word Deism. Believers in Pantheistic or Pandeistic systems equate God with the Universe, and may refer to God by that term (sometimes using the definite article and referring to God as "the Deus"). Several religions advance taboos related to names of their gods. In some cases, the name may never be spoken, or only spoken by inner-circle initiates, or only spoken at prescribed moments during certain rituals. In other cases, the name may be never freely spoken, but when written, taboos apply. It is common to regard the written name of one's god as deserving of respect; it ought not, for instance, be stepped upon or dirtied, or made common slang in such a way as to show disrespect. It may be permissible to burn the written name when there is no longer a use for it. Copies of the Torah are, like most scriptures, heavily used during worship services, and will eventually become worn out. Since they may not be disposed of in any way, including by burning, they are removed, traditionally to the synagogue attic. See genizah. There they remain until they are buried. All religious texts that include the name of God are buried. God's name being used in vain can also be interpreted as trying to invoke the power of God, as a means to impress, intimidate, punish, condemn, and/or control others. Since "God is a loving God", any efforts to use God's name in vain will forever be fruitless. Love is not compelled into action by fear. Saying that God's name should not be used in vain is just a helpful reminder that doing so is just a waste of time and energy. This can also be used to refer to the idea of saying that one acts "in God's behalf" when doing things that are clearly personal actions (the Crusades were a good example of this). Different Christian cultures have different views on the appropriateness of naming people after God. English speaking Christians generally would not name a son "Jesus", but "Jesús" is a common Spanish first name. This taboo does not apply to more indirect names and titles like Emmanuel or Salvador. The taboo on abuse of the name of God and religious figures like Mary, mother of Jesus leads to their frequent use in profanity (a clear case is Quebec French profanity, based mostly on Catholic concepts). More pious swearers try to substitute the blasphemy against holy names with minced oaths like Jeez! instead of Jesus! or Judas Priest! instead of Jesus Christ!. Traditionally, when a copy of the Bible is worn out, the book is burned, not simply thrown away. Tabuism or glorification are usually reasons not to refer to a deity directly by name. In addition to capitalized pronouns (e.g. He, Him), this can be split into two types: Phrases (such as King of Kings) and alternatives (such as G*d or HaShem). Generally, phrases are used to extol, and alternatives are more direct replacements for words. Eru Ilúvatar, a name of monotheistic God in Quenya, a fictional language invented by J. R. R. Tolkien. In the Cthulhu Mythos, speaking the name of the deity Hastur aloud can bring down a curse or other manner of divine retribution on the speaker. Similarly, if a person even reads the name of the god Y'golonac, even if the name is not read aloud, it can allow the Y'golonac to invade that person's mind and take over their body. ^ Baesler, E.J. (2001). "The Prayer of the Holy Name in Eastern and Western Spiritual Traditions: A Theoretical, Cross-Cultural, and Intercultural Prayer Dialogue*.". Journal of Ecumenical Studies: 196–217. http://www.questia.com/PM.qst?a=o&se=gglsc&d=. ^ The New Encyclopædia Britannica, Vol. 12, 1998, Chicago, IL, article "Yahweh," p. 804. ^ Bible Dictionary by William Smith LLD 1948 p.307; An Expository Dictionary of NT Words by W.E. Vine 1965 edition p.275, Websters English Dictionary; etc. This page was last modified on 10 April 2009, at 19:35 (UTC).